RA Healing Centre offers cold laser therapy, physiotherapy and hydrotherapy to complement vet treatments to make pets feel better. When nine-year-old Yorkshire terrier Maeko was referred to Ra Healing Centre, billed as Singapore's first full-fledged animal rehabilitation centre, it suffered from spinal disease and arthritis, which caused it to be completely immobile. Unable to sit or stand, it could only lie down. After several sessions of rehabilitation - first to manage its pain and then to get it to use its limbs - Maeko slowly, but surely, began to stand and, finally, walk. It is among the pets whose owners say have benefited from alternative therapies such as acupuncture, traditional Chinese medicine and post-surgical manipulative therapy. Although the Agri-Food & Veterinary Authority of Singapore (AVA) cautions that such therapies are not considered part of conventional veterinary medicine and encourages pet owners considering them to seek the advice of their vets, these therapies have the support of some pet owners and vets. For example, Dr Jean-Paul Ly, 68, a veterinarian and consultant at Doctors Beck and Stone, a group which provides veterinary services, referred Maeko to the centre, which opened in June last year. He says: "I think rehabilitation helped Maeko. When treating a patient, we should involve different disciplines. Physical therapy - which involves the physical aspects of the animal's body - is one of these disciplines. I would not call such therapy 'alternative', but 'complementary' to veterinary treatment." In January this year, Bentley, a four-year-old labradoodle, was also referred to the centre after it had surgery on one of its hind legs, by Dr Simon Quek, a veterinarian at the Clementi branch of Mount Pleasant Animal Medical Centre. Dr Quek, 43, says: "I recommended Bentley for physiotherapy because although it recovered well after surgery, it carried its leg when running due to a lack of muscle mass. With physiotherapy, it gained muscle. Now, it can use its leg normally again." An online search reveals at least 15 providers of such therapies for pets in Singapore. RA Healing Centre, for example, offers rehabilitation for pets that are old, overweight, have congenital issues or have recently undergone surgery. So far, it has helped more than 100 pets, mostly dogs. Staffed with canine rehabilitation practitioners, hydrotherapists and animal therapist assistants, the centre treats only pets referred by licensed vets, says its owner, Ms Nicole Chin, 43. She says: "The therapy we provide complements conventional medicine prescribed by vets." 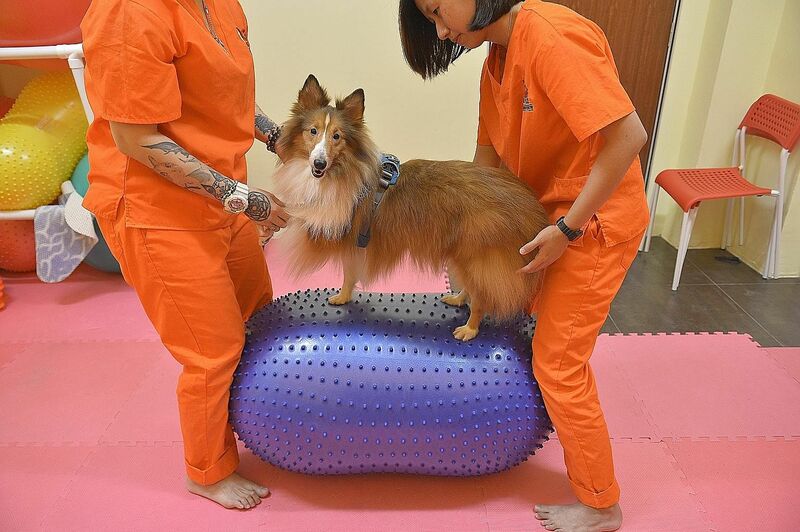 At her centre in Serangoon Road, rehabilitation is carried out through methods such as neuromuscular electrical stimulation, cold laser therapy, heat therapy, as well as swimming and letting pets walk on an underwater treadmill. Fees range from $65 for a half-hour "fun swim" session to $150 for a one-hour rehabilitation session. To ensure pets' safety, the centre asks for their medical history to ensure that their programmes do not interfere with the animal's medical condition or vet's treatment. The centre also uses only certified therapists and does not offer services that are considered invasive. The Visiting Vets, a veterinary clinic located next to the Singapore Botanic Gardens, provides Western veterinary acupuncture, among other services such as house calls, diagnostic and surgical services. Ms Jane Tan, 34, the clinic's veterinary acupuncturist and nurse, says: "Acupuncture is not a cure but a supportive and complementary therapy that goes hand-in-hand with veterinary treatment. It can be therapeutically beneficial and an effective treatment for pain management, especially for older pets or those unsuited to take long-term oral pain medications." Pet owner Loo Ke Ying, 33, believes acupuncture provided by the clinic has helped her three Jack Russell terriers. Pecan, 14, has arthritis and tends to tremble, probably due to discomfort and pain; Sam, seven, has a knee condition and used to skip occasionally when running; and Pippin, four, has a curved spine and was born with only three limbs. The marketing executive says: "I am open to trying out complementary therapy as I find traditional vet treatments can be quite conservative. I am also cautious about side effects that can arise from medication prescribed by vets. "So far, acupuncture has helped my dogs. Pecan's trembling has reduced. Sam's skipping has stopped. And Pippin is moving around more." An AVA spokesman says: "Alternative veterinary therapies may diverge from veterinary medicine routinely taught in recognised veterinary medical schools or may differ from current scientific knowledge, or both. "Alternative therapy providers should not claim to make any veterinary diagnosis, provide veterinary treatment or dispense veterinary drugs. These can be conducted only by licensed veterinarians." While the authority has not received any complaints against alternative service providers for the past two years, it says members of the public and pet owners should inform AVA if there are any animal welfare concerns arising from these therapies. Its spokesman says: "AVA will take action if there are valid grounds that animal welfare is compromised."